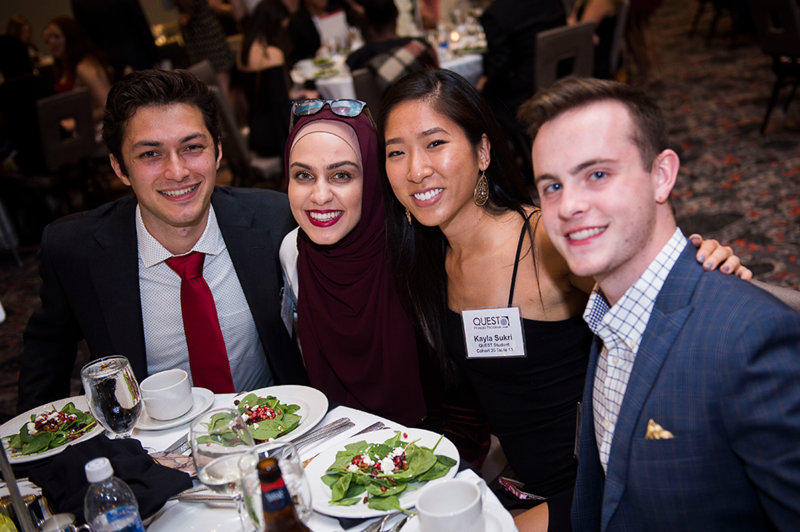 The Quality Enhancement Systems and Teams (QUEST) honors program celebrated 25 years of hands-on education in quality management, process improvement, and system design on Saturday, October 7, 2017 with a gala at The Hotel, the brand new luxury hotel and conference center at the University of Maryland. More than 420 students, alumni, faculty and staff, and QUEST family and friends attended the event celebrating the program, students of which represent majors within three colleges of the university: the A. James Clark School of Engineering, Robert H. Smith School of Business, and College of Computer, Mathematical, and Natural Sciences. Ricky Wilson, QUEST Alumni Board chair (Cohort 6), Clark School alumnus, and the emcee for the event, welcomed attendees and introduced the deans from the three schools that make up the program: Dean Pines; Dean Alex Triantis, Smith School; and Interim Dean Jerry Wilkinson, College of Computer, Mathematical, and Natural Sciences. “The program offers a unique experience that prepares students to succeed in the workplace, learn to work in teams in pressure situations, and to be comfortable stretching themselves,” said Wilson. “The program has helped me to get a head start working on cross-functional teams it helped me learn to consider different professional and cultural perspectives, and also taught me the importance of building social capital." Three QUEST alumni spoke about their experiences in the program during the event Debbie Feinberg (Cohort 1), Vlad Tchompalov (Cohort 14), and Addrenia Smith (Cohort 18). A current QUEST student, Rachit Agarwal (Cohort 30), gave the closing remarks discussing his thoughts on the program. Since the start of the program, more than 1,000 students have participated. Of the students in cohorts 25 through 30, 39 percent are from the Clark School. Noah Vernick, a junior mechanical engineering undergraduate student, applied to the QUEST program his freshman year and has since developed his leadership and interpersonal skills. Six alumni received inaugural alumni awards during the event, presented by current and former QUEST staff. Jason Gates (Cohort 16) was awarded the Innovative Professional Achievement Award; Steve Kutchi (Cohort 1) was awarded the Outstanding Corporate Connector Award; Danny Laurence (Cohort 19), Bryan Towns (Cohort 7), and Ricky Wilson (Cohort 6) were awarded the Outstanding Service Award; and Linda Rassenti (Cohort 17) was awarded the Outstanding Young Alumna Award. QUEST corporate sponsors were also recognized at the event with an acknowledgement to their Corporate Visionaries (IBM, Orbital ATK, and Leidos) who have given $100,000 or more to QUEST; Corporate Innovator (Lockheed Martin) who has given $50,000 or more to QUEST; and Corporate Catalysts (dlhBOWLES, BD, PwC, Tulkoff Food Products, Inc., and Unilever) who have given $25,000 or more to QUEST. From September 7, 2017, to October 7, 2017, teams of current QUEST students mentored by alumni worked to create a product or service through the month-long IBM Design Challenge competition. The theme was "The World is Flat: Products and Services that Reduce the Separation of People." The winning team was International Business Men, followed by Senior Citizens in second place, and The Village in third place. The International Businessmen created an online resource called "JusThis" for people who seek to file a small claim. Judges from IBM and the university selected the winner based on the strategic concept/potential for impact, the business plan/feasibility, the presentation, and the relevance to the theme. The winning team and their alumni mentors will receive a trip to the IBM Watson Global Headquarters in NYC’s Silicon Alley.